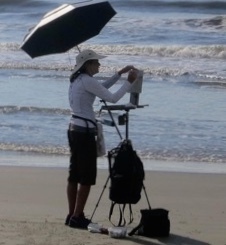 If you are thinking of becoming an outdoor painter or have recently taken it up you might be interested in this post. The process of painting on location can be daunting in the beginning. My first attempts were pretty discouraging. Having the right gear is the best insurance for getting off to a good start and makes the practice much easier. This is kind of long and if you don't want to read the whole thing please read the last paragraph. A backpack, wet panel carrier and an umbrella in its carrying bag. I don't always take the umbrella (if I know I'll have shade or if the conditions include strong winds). The backpack weighs 16 lbs. when fully loaded. That's a bit heavy but I can wear it while riding a bike and can hike a fair distance with it if I need to. I'm going to show you what I have in each compartment in the pack which is an Odyssey 39 by Jansport (from REI). There are packs on the market specifically designed for painters but I have never tried one. This pack has 5 zipped compartments- 2 larger ones and 3 smaller (i.e. not as deep). A collapsible mesh trash container and a brush holder. Both are flat when closed. I never have to remember to bring plastic bags. My Strada "mini" paintbox with one side tray for extra mixing and/or brushes. A very lightweight compact tripod and a rag. The tripod and paintbox fit side by side and the tray alongside. An over half empty package of baby wipes, an over half empty roll of paper towels with bungie cord to serve as towel holder. A small sized bush washer (Holbein recommended- size small), a food container for paint tubes, hook to hang brush washer (Strada make a good one for their box, not included) and a small but good quality vise wrench for stubborn tube caps. The brush washer and paint holder go in first, the wipes and towels on top. Remember my advice from the last post- try to use the most limited palette you can outdoors. Paint is heavy. I like the fact that this pack has zipped pockets and pen holders. I always carry my viewfinders, value markers, palette knife and a pen and pencil. The last compartment which is also fairly shallow holds my sketchbook which I don't always carry, just depends. There is a small flat zippered pocket on the front of the pack and I put lip balm with SPF and business cards. There are outside stretchy pockets on each side for a small can of mineral spirits (in case of a spill) sunscreen and 2 bug sprays. One has DEET and is for mosquitoes/ticks. The other is "No Natz" which specifically wards of gnats- great product. I always bring a water bottle and maybe lunch in a very small vinyl cooler with some ice. And a good sun hat. My phone, wallet and keys go in my pockets or waist pack. You can click on this photo for a closer look. The bungie cord holds the towel roll on the front of the paintbox. The back pack hang from a hook on the tripod for added stability. The brush washer hangs on one side of the box and the side tray is on the other side. This provides plenty of mixing space for me. In the first photo I showed the wet panel carrier I use which is made by RayMar. They are reasonably priced, very strong, lightweight and come in a variety of sizes. Many of the products I have mentioned today are posted as links below. Though I love my tripod (made by Mefoto) it is a bit fragile and some of my friends have had trouble with the leg adjustments. I am gentle with mine and have not had any problems. It can hold up to 8 lbs. which is more than my set up. For a lot more money you can get stronger lightweight tripods. When fully collapsed the Mefoto is only 12" which is ideal for a back pack. 1. Clean the paint box and put clean mineral spirits in the brush washer. Repack. 3. Restock consumables (baby wipes, paper towels and paint). I have made a habit of putting almost empty paper towel rolls, wipes and paint tubes (especially the large ones that are almost empty) in a box by my back pack to make restocking more convenient. 4. Restock your panel carrier for next time. This way you won't realize at the last minute that you are out of the panel sizes you use outdoors. 5. 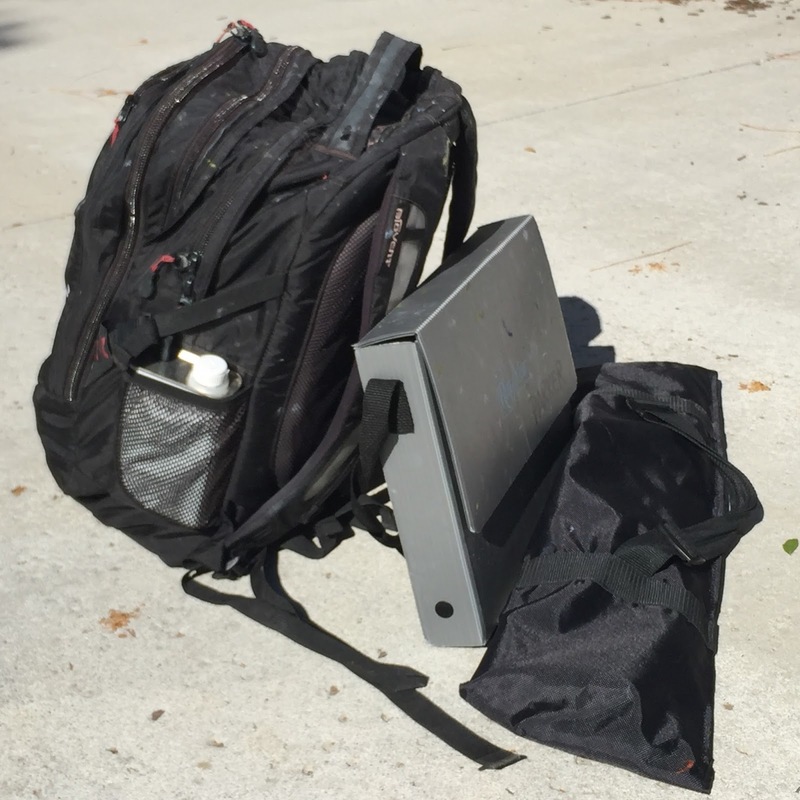 Figure out how your backpack wants to be packed and always repack it the same way. This makes it much easier to take inventory and to set up and break down. 6. Since I never need to take my umbrella inside I keep it in the car. One less thing to remember! So... the message is PAINT- RESTOCK- REPEAT. Got it? Thanks in general for your posts, I enjoy reading them. Thank you for reading and for your comments Mary!